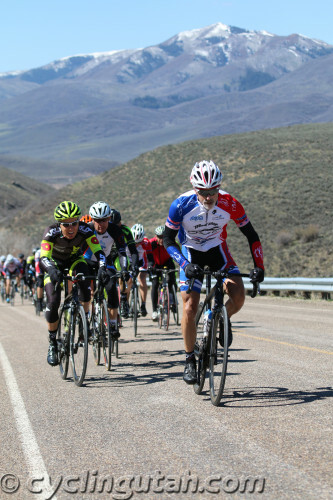 April 2015 – On a brilliant and breezy spring day, nearly 300 racers lined up at the Sports-Am East Canyon-Echo Road Race in Henefer, Utah on April 18, 2015. The beautiful 60 mile road race featured three ascents of Hogsback Summit – 2 from the east and one from the west along with a trip by East Canyon Reservoir and a traverse of Echo Canyon Road. In the men’s Pro/1/2 race, an early break formed with the quintet of strong riders Jason Castor (FFKR/Contender), Cortlan Brown (Astellas), Jared Brewer (FFKR/Contender), Rob Smallman (Team Endurance 360), and Michael Wilcox (Canyon-Shimano). They rode to an early one minute lead, but were reeled back in on the back side of the course before the turnaround. The break would bode well for Canyon-Shimano. With seven riders in the field, they let the other teams work and thus remained relatively fresh for the finishing climb. Canyon set up their train in the town of Henefer, just before the climb. They strung it out, blowing riders off the back. 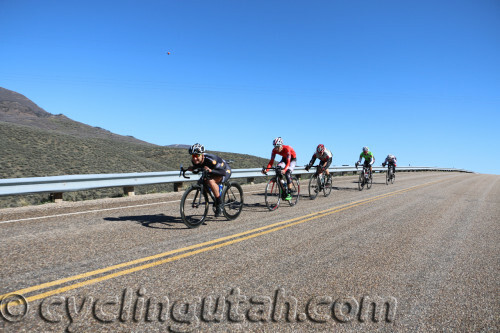 Tim Mulvihill (FFKR/Contender) went to the front and reduced the lead group to six guys – Justin Griffin (FFKR/Contender), Mulvihill, Mitchell Peterson (Canyon-Shimano), Cameron Hoffman (Endurance 360), Ben Schmalz (Cicada Racing) and Cortlan Brown. When Peterson attacked when the road steepened, the group was reduced to three – Peterson, Griffin, and Brown. In the women’s race, seven riders (of nine starters) stayed together until the East Canyon turnaround with two riders falling off. The remaining five – Mindy McCutcheon (Canyon Bicycles – Shimano), Jannalyn Luttrell (Harristone – Sun Valley Mortgage), Brook Mickelson (Team Red Rock), Mary Emerson and Megan Lowe (both of Team TOSH p/b Hyperthreads) – stayed together until the final climb. McCutcheon went to the front and “I just drilled it as hard as my little legs could.” McCutcheon dropped the riders one by one until about a kilometer to go when she dropped Mickelson to take the win with Luttrell following in third place. In the men’s 3-4 race, there was a break of five early on and stayed out until the turnaround. SBR Cycles rode well as a team. 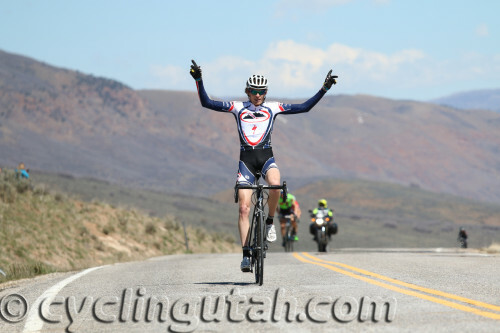 Nate Curtis (SBR) helped to reel the break in and pulled the group in to the final climb. Joe Stewart (SBR Cycles) and teammate Tanner Soelberg led the final climb, pulling away and soloing the last kilometer. Joergan Trepp (Cicada) and Soelberg rounded out the top three. In the Masters 35+ race, Margaret Douglass followed Robyn Masters and Kelly Hunsaker (both of Ski Utah/Plan 7) on the final climb. Former Masters National Champion Douglass went with about 500 meters to go, “Sooner than I wanted. I led it out because it was time to go and I went. I just go intuitively.” When asked how she felt, she remarked, “A win always feels good because they are tough to get.” Hunsaker finished second and Masters third. In the juniors race, Luke Heinrich and Jack Shuckra (both of FFKR/Contender) rode together over the fourteen mile course until a few hundred meters before the finish when Heinrich dropped Shuckra to take the win. Other category winners included Masters 45+ Jeff Sargent (Ski Utah/Plan 7), Women’s 3-4 Ali Knutson (Harristone/Sun Valley Mortgage), Women’s Masters Margaret Douglass (Endurance 360), Men’s 4-5 Andrew Dorais, Men’s 3-4 Joe Stewart (SBR CYCLES-LHM FORD LINCOLN PRO), Masters 55+ Jerald Hunsaker (Bountiful Mazda Cycling Team), Men’s 35+ B Lucas Parker (Spider Bait Cycling), and Men’s 35+ A Jared Kirby (Bountiful Mazda Cycling Team).